Our chainless conveyor technology maximizes efficiency and minimizes floor space. Part variety is one of the strengths of this system. The overhead design, smart controls and flexible design allow parts to move forward and reverse within the system. Line speed variablility, loadbar vs. batching and recipe based coating are additional features that make the IntelliFinishing industrial paint system the stand-out system in the finishing industry. Variable speed ability is the “brains” of our complete automated finishing system. Our easy-to-use computer panel makes changing formulations and recipes a snap. Different sizes and shapes of parts can all run on the system. The system allows you to leave parts longer in the washer, if necessary. Need a part to cure longer? It’s not a problem either. Energy savings and labor savings to help your bottom line are an additional system bonus. The smart controls in the IntelliFinishing system let you control which parts of the system that run. Washer modules do not have to run constantly from start to end of shifts. If a smaller part only takes up one-third of the washer, then only that area operates. Plus, our washers have doors which open and close when a part enters and exits the treatment stage to reduce cross contamination. These features can save you up to 50% on resource usage. Floor space is utilized with unique design features. The IntelliFinishing Liquid Coating System or Powder Coating System is a modular system that uses less building space to accomplish the same tasks as traditional systems. It also installs in half the time, getting our customers up and running quickly. Our most recent install was completed in just 39 days. This complete finishing system for industrial manufacturing can be relocated easily, if necessary. 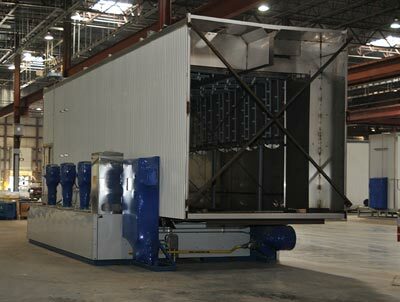 Installing in phases, or as your production grows is also a key part of the unique design capabilities. The layout possibilities are endless. IntelliFinishing washers are designed for quick installation and are the most energy efficient in the industry. The modular design gives us the ability to send the washers to our customers pre-fabricated, pre-wired, pre-plumbed and ready to put in place in your facility. The control system technology provided with our washer modules is designed to save resources, chemicals and energy for our customers.